I love experimenting with recipes for summer BBQ’s that are just around the corner. 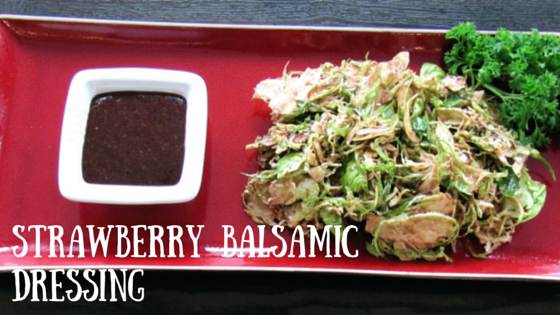 This Strawberry Balsamic Dressing is sure to please all taste buds. I tossed it with Brussels sprouts that I shaved with a mandolin, and also served it with a tossed salad. Both were delicious. It will keep in the fridge for two weeks, if sealed tightly in a container or mason jar. Add strawberries and balsamic vinegar to a small saucepan. On medium-high heat, bring to a boil and let simmer until sauce has reduced and thickened. Once sauce has thickened, remove from heat, set aside and let cool. Once sauce has cooled, place in a blender with extra-virgin olive oil and lemon juice. Blend until smooth.